These Strawberry Mango Salsa Cups are sweet, juicy, crunchy and super easy to make. They’re a great combination of flavors and textures perfect for summer. What I love about summer is all the fabulous fresh fruits that are available. 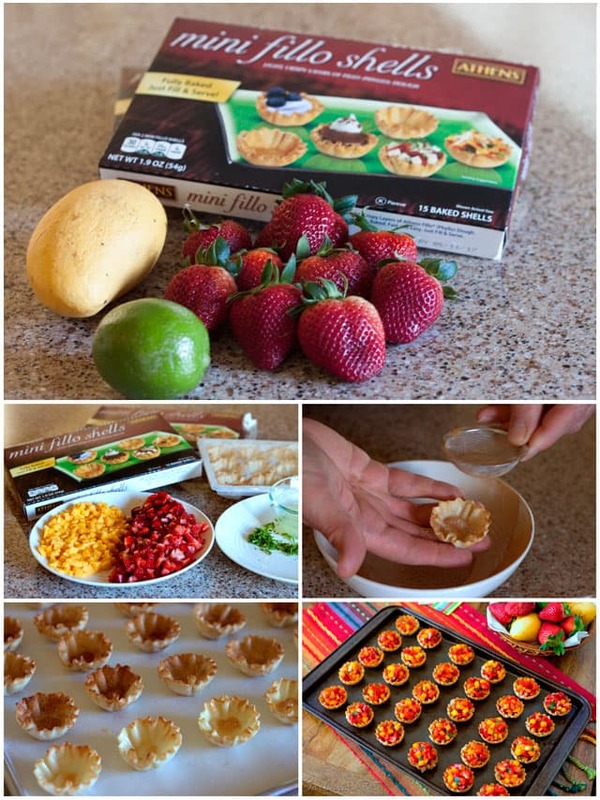 So when Athens Foods challenged me to create a fun summer appetizer recipe using their convenient, ready to use frozen mini Fillo Shells I knew I wanted to pair them with fruit. I often serve Strawberry Mango Salsa and Cinnamon Tortilla Chips for summer get togethers. It’s always a hit, but also a little difficult to eat. So I decided it would be fun to use the Athens Mini Fillo Shells to turn it in to an easier-to-eat, easier-to-serve appetizer. 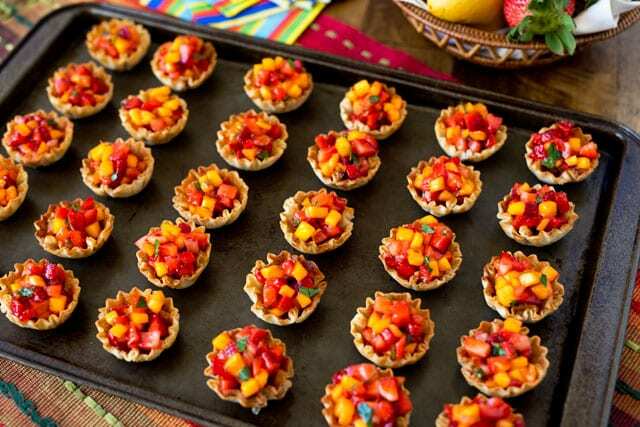 They’re great for a party because you can make the salsa and bake the cinnamon sugar cups ahead of time. Then right before you serve them you can quickly fill the shells with salsa and they’re ready to serve. My family devoured these. Five of us ate all 30 in less than five minutes. If you’re making them for a party, I’d definitely double the recipe. Your guests will be glad you did. Combine all ingredients in a medium size bowl and chill until ready to serve. Preheat oven to 400°. Place mini fillo shells on a baking sheet lined with parchment paper or tin foil. In a small mixing bowl, combine sugar and cinnamon. Lightly brush cups with butter and sprinkle with cinnamon sugar mixture. Bake 4 minutes until shells are golden brown. 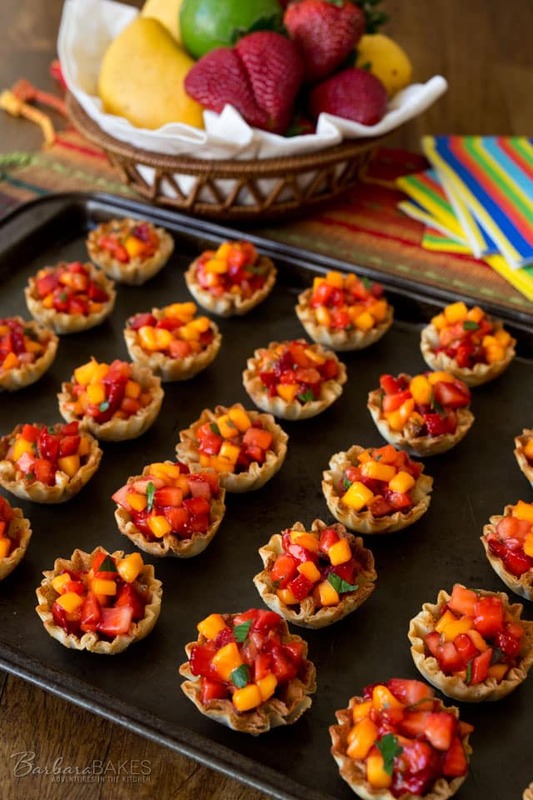 Fill shells with strawberry mango salsa right before serving. These look amazing! I love that you served them as is with no extra creamy stuff so they are bursting with fresh flavor. The mini fillo cups are the perfect edible serving dishes. Thee are so cute. I love fruit salsa and this is a great way to make it easy to pop in your mouth. No need to dunk. Love it. Awesome photos too. Oh my goodness! These look delightful. Your idea of turning them into cinnamon cups is brilliant. I would devour them too! I’ve got a brunch coming up on Memorial Day, and I need to make these part of my menu!! Thanks Susan – definitely perfect for Memorial Day. Those would be a BIG hit at summer parties here. We love strawberry salsa-add mangoes? Even better! They’re so pretty too. Phyllo cups are the best! Love how colorful these are! I could not be trusted with those on a plate. I’d eat them all! What a perfect summer appetizer!